Besides his half-brothers, the narrow-fronted and ant-eating woodpeckers, the Carpenter has a numerous family of cousins,—the red-headed, the red-bellied, the golden-fronted, the Gila, and the Lewis’s woodpeckers. These all belong to one genus, and are much alike in structure, though totally different in color. Most of them are Western or Southwestern birds, but one is found in nearly all parts of the United States lying between the Hudson River and the Rocky Mountains, and is the most abundant woodpecker of the middle West. 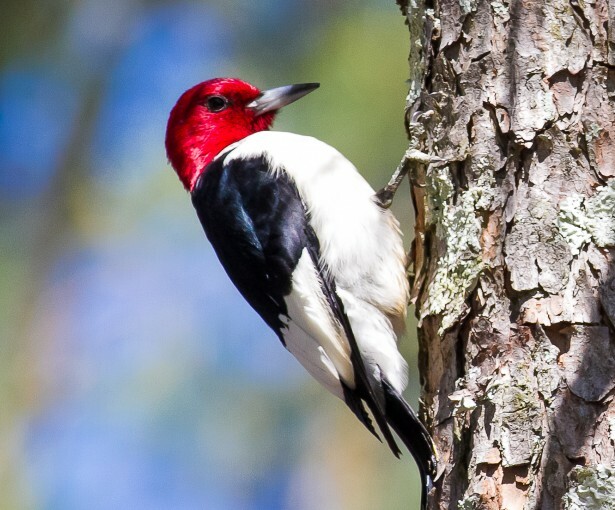 This well-known cousin is the red-headed woodpecker, the tricolored beauty that sits on fence-posts and telegraph poles, and sallies out, a blaze of white, steel-blue, and scarlet, a gorgeous spectacle, whenever an insect flits by. He is the one that raps so merrily on your tin roofs when he feels musical. So named from being found along the Gila River. In many ways the red-head, as he is familiarly called, is like his carpenter cousin. Both indulge in long-continued drumming; both catch flies expertly on the wing; and both have the curious habit of laying up stores of food for future use. The Californian woodpecker not only stores acorns, but insect food as well. But though the Carpenter’s habits have long been known, it is a comparatively short time since the red-head was first detected laying up winter supplies. The first to report this habit of the red-head was a gentleman in South Dakota, who one spring noticed that they were eating young grasshoppers. At that season he supposed that all the insects of the year previous would be dead or torpid, and certainly full-grown, while those of the coming summer would be still in the egg. Where could the bird find half-grown grasshoppers? Being interested to explain this, he watched the red-heads until he saw that one went frequently to a post, and appeared to get something out of a crevice in its side. In that post he found nearly a hundred grasshoppers, still alive, but wedged in so tightly they could not escape. He also found other hiding-places all full of grasshoppers, and discovered that the woodpeckers lived upon these stores nearly all winter. But it is not grasshoppers only that the red-head hoards, though he is very fond of them. In some parts of the country it is easier to find nuts than to find grasshoppers, and they are much less perishable food. The red-head is very fond of both acorns and beechnuts. Probably he eats chestnuts also. Who knows how many kinds of nuts the red-head eats? You might easily determine not only what he will eat, but what he prefers, if a red-headed woodpecker lives near you. Lay out different kinds of nuts on different days, putting them on a shed roof, or in some place where squirrels and blue jays would not be likely to dare to steal them, and see whether he takes all the kinds you offer. Then lay out mixed nuts and notice which ones he carries off first. If he takes all of one kind before he takes any of the others, we may be sure that he has discovered his favorite nut. Such little experiments furnish just the information which scientific men are glad to get. It is well known that the red-head is very fond of beechnuts. Every other year we expect a full crop of nuts, and close observation shows that the red-heads come to the North in much larger numbers and stay much later on these years of plenty than on the years of scanty crops. Lately it has been discovered that they not only eat beechnuts all the fall, but store them up for winter use. This time the observation was made in Indiana. There, when the nuts were abundant, the red-heads were seen busily carrying them off. Their accumulations were found in all sorts of places: cavities in old tree-trunks contained nuts by the handful; knot-holes, cracks, crevices, seams in the barns were filled full of nuts. Nuts were tucked into the cracks in fence-posts; they were driven into railroad ties; they were pounded in between the shingles on the roofs; if a board was sprung out, the space behind it was filled with nuts, and bark or wood was often brought to cover over the gathered store. No doubt children often found these hiding-places and ate the nuts, thinking they were robbing some squirrel’s hoard. In the South, where the beech-tree is replaced by the oak, the red-heads eat acorns. I should like to know whether they store acorns as they do beechnuts. Are chestnuts ever laid up for winter? How far south is the habit kept up? Is it observed beyond the limits of a regular and considerable snowfall? That is, do the birds lay up their nuts in order to keep them out of the snow, or for some other reason? It remains to be discovered if other woodpeckers have hoarding-places. We know that the sapsucker eats beechnuts, and the downy and the hairy woodpeckers also; that the red-bellied woodpecker and the golden-winged flicker eat acorns; and I have seen the downy woodpecker eating chestnuts, or the grubs in them, hanging head downward at the very tip of the branches like a chickadee. It may be possible that some of these lay up winter stores. This is Chapter XI from The Woodpeckers book. Our writer, Fannie Hardy Eckstorm, wrote this in 1901. There are 16 chapters, plus the Forward, which are about the Woodpecker Family here in America. All the chapters can be found on The Woodpeckers page. I added photos to help enhance the article. In 1901, photography was not like today. The Red-headed Woodpecker (Melanerpes erythrocephalus), which belongs to the Picidae – Woodpeckers Family, is a small or medium-sized woodpecker from temperate North America. Their breeding habitat is open country across southern Canada and the eastern-central United States. 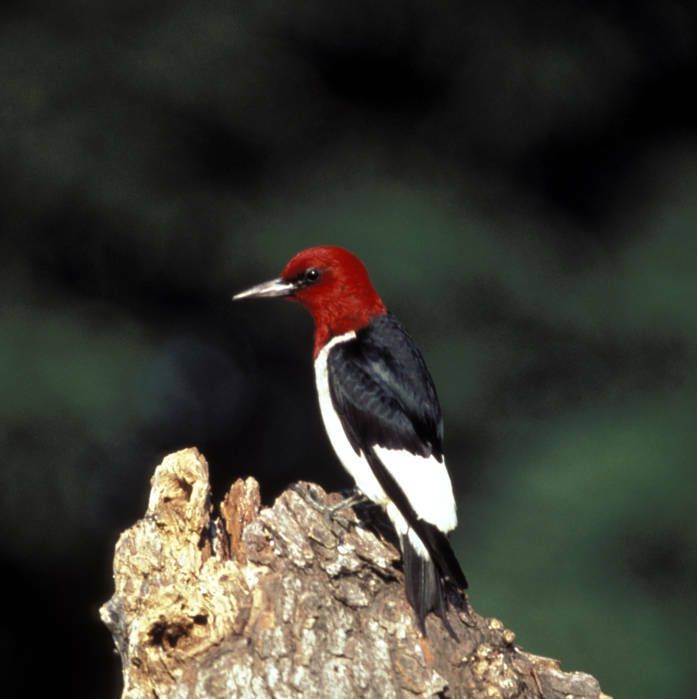 The Red-headed Woodpecker was one of the many species originally described by Linnaeus in his 18th-century work Systema Naturae. The specific epithet is derived from the Ancient Greek words erythros ‘red’ and kephalos ‘head’. Adults are strikingly tri-colored, with a black back and tail and a red head and neck. Their underparts are mainly white. The wings are black with white secondary remiges. Adult males and females are identical in plumage. Juveniles have very similar markings, but have an all grey head. This entry was posted in Birds, Birdwatching and tagged Christian, Fannie Hardy Eckstorm, From The Past, Nature, Picidae, Red-bellied Woodpecker, Shirt-tail Bird, The Woodpeckers. Bookmark the permalink.